Thanks to @dave42w who linked to this with a simple “we need the new testament”. ‘Biblical’ marriage or ‘Torah’ marriage? 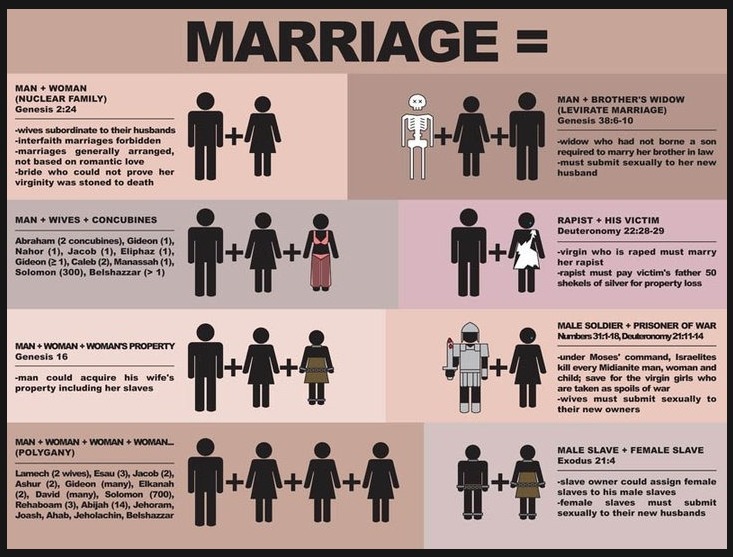 There’s a lot of things said about marriage and relationships in other parts of both old and new testament that are missing from this (albeit very interesting!) image, which mainly draws from the first 5 books of the bible – this is from a very early stage in Israel’s history and if you consider these laws in that context, I suspect they were actually quite protective of women and slaves at that time (shocking though that might seem to us now). Perhaps it’s most important to understand the meaning and spirit behind the law within that context, and then to apply that to our current context?